The government of Ethiopia formulated a Food Security Program (FSP) which encompassed a shift of households from emergency relief system to sustainable food security system. The Productive Safety Nets Program (PSNP), a core element of the broader Food Security Program of the country, has been implemented since 2005. It relieves people of the persistent and recurrent destitution associated with food crises, and ensures that the most vulnerable households do not go hungry. Taking a two-pronged approach, it tackles the household’s immediate and future needs. It pays people for labour-intensive work on community infrastructure during times when farm work is not an option. The PSNP’s Public Works (PW) program is designed to address a key underlying cause of food insecurity which is believed to be environmental degradation. The PSNP PWs activities were carefully crafted and implemented to involve as much labor as possible and to help reduce the root causes of vulnerability to drought and food insecurity. PWs focus on integrated community-based watershed development, covering activities such as soil and water conservation (SWC) measures, rangeland management (in pastoral areas), and the development of community assets such as roads, water infrastructure, schools, and clinics. These works contribute to improved livelihoods (through increased availability of natural resources including water and cultivatable land, soil fertility, increased agricultural production and improved market access), strengthened disaster risk management and climate resilience, and nutrition. In this paper some evidence findings from the Public work impact assessments and the Climate Smart Initiative (CSI) pilot are presented as lessons learned to illustrate the PSNP support to sustainable growth and transformation. A series of high-level policy documents set out a clear vision for Ethiopia’s future, charting a path for the country’s economic, social and political development. This vision creates the context for a national safety net programme. The Government of Ethiopia’s current Growth and Transformation Plan (GTP-II) aims to enhance productivity and production of smallholder farmers and pastoralists; strengthen marketing systems; improve participation and engagement of the private sector; expand the amount of land under irrigation; and reduce the number of chronically food insecure households. GTP II represents a key development in Ethiopian climate policy. It is the first five-year plan to mainstream climate through its framework, integrating the objectives of the recent Climate-Resilient Green Economy strategy. GTP II recognizes the growth and poverty alleviation potential of smallholder agriculture that is not only dynamic and market-oriented but also climate resilient. The PSNP fits within this overall plan and contributes to four key policies: the Social Protection Policy, the Disaster Risk Management (DRM) Policy, the National Nutrition Programme (NNP), and the Climate Resilient Green Economy Policy (CRGE). In a rural country like Ethiopia, broad-based agricultural growth provides the foundation for resilient livelihoods, while underpinning wider economic transformation. People who are chronically food insecure, poor or vulnerable cannot engage in or contribute to the agricultural growth and transformation agenda. Even if food consumption is smoothed through the safety net, people with limited assets have difficulty engaging in or contributing to more productive agriculture or other growth-oriented economic activities. Thus, investment in an effective safety net and a systematic approach to asset building are prerequisites for broad-based growth and transformation. As such, they epitomise the notion of ‘smart economics’. The PSNP and HABP together have shown themselves to be an effective means of addressing chronic food insecurity and poverty. For example, in 2006, PSNP clients in highland programme areas had 8.4 months of food security on average; by 2012 this had risen to 10.1 months. The PSNP has been shown to increase participating households’ food security by 1.48 and 1.93 months per year respectively for those doing PWs and those receiving direct support. In 2010/11, cash transfers as part of the PSNP reduced the rural poverty gap by 10.5 per cent. Transfers per client equate to 10 per cent of the poverty line, and have raised a fifth of clients above that line. Sixty-two per cent of clients avoided selling assets in 2012, 90 per cent of which is attributable to the PSNP. Asset liquidation is a common coping strategy, but one which can undermine the household asset base of PSNP clients, weakening their resilience. At the community level, the PSNP has contributed to the extension and improvement of productive assets in many rural areas. Seventy-six per cent of households report benefiting from road construction through improved market access, increased productivity and easier access to education. Similarly high percentages (62 and 71 per cent respectively) report that they benefit from PWs school and health post construction, with 56 per cent and 60 per cent respectively reporting that education and health services had improved as a result. The overall aggregated NPV (net present value) for all sub-projects was estimated to be ETB 10,201.9 million. PWs have also resulted in considerable environmental improvements. Area closure and enrichment plantation works which were implemented on degraded farmlands and/or grazing lands have regenerated to either dense or open woodlands. Woody Biomass Production from Area Closures is now about 10,682 MT/Ha, is more than double compared to the rate of production at the start of PSNP which was only 5,194 MT/Ha. The total runoff volume in the watersheds as well as flooding and sedimentation in and out of the watershed areas has also shown remarkable reduction. The PW interventions have reduced the soil loss by 32.2%, which is much greater than the project’s target of 25%. This reduction of soil loss varied from ‘nil’ in areas where there was no SWC activity to nearly 57% in high altitude highland watershed. There is some evidence that these environmental improvements have also provided new income streams, such as from beekeeping on new enclosures and cutting and selling grass as livestock fodder and roofing material. However, communities need ongoing support to sustain the impacts of the PWs conservation activities realized so far. In essence, strengthening climate resilience means building people’s capacity to (1) withstand extreme events without food aid and (2) actively manage their livelihoods so they are able to provide food for their families in the face of changing weather patterns. The PSNP help build resilience in three ways: by preventing the depletion of household assets; by providing more options to help people withstand and recover from shocks and stressors; and by building people’s capacity to deal with the range of possible future climate risks. For example, organizations can support and strengthen adaptive capacity and resilience through the following types of activities. Improving water security: Climate change is projected to lead to changes in seasonal patterns of rainfall, including longer dry spells, which will hamper access to water. Managing water more effectively is therefore crucial. The PSNP uses the watershed management approach, which involves soil and water conservation activities, reforestation, and enclosures. For example, the Orotho rock catchment (Arero woreda, Oromia) was constructed through PSNP PWs in 2011, and has so far benefited at least 350 households. It has been particularly beneficial for women and children, who typically carry the main burden of collecting water. The HABP provided credit for water pumps and water storage facilities, which enables cropping all year round. Supporting pastoralists: Climate change is expected to lead to further challenges for pastoralists, for whom mobility is the traditional strategy for dealing with climate variability. The PSNP and HABP are working in different ways to address constraints to movement, poorer pastures and declining productivity. The PSNP’s support to enclosed areas has helped regenerate vegetation, reduce seasonal floods and soil erosion, and support a wider range of livelihood options. The PSNP and HABP have meant that poorer households without access to livestock can invest in alternative livelihood activities such as fodder production and crop farming. Diversifying livelihoods and markets: The PSNP and HABP work in complementary ways to support more diverse livelihoods, which is a cornerstone to resilience. In Tigray, for example, improved management and rehabilitation of local watersheds made it possible for the HABP to support a wider range of livelihood activities. In Afar, PSNP PWs supported an irrigation scheme on land that previously could not be farmed. The HABP’s support allowed women to invest in the production of high-value onions and chillies. This kind of diversification is not only vital for increasing current incomes but also strengthens people’s ability to adapt to an uncertain future. Empowering local ownership and decision-making: Through close engagement with local people, the PSNP and HABP stimulate local ownership of and action on adaptation. For example, the implementation process for PWs has created functional structures at different levels – including micro-watershed planning groups, water user groups, kebele- and woreda-level planning, technical committees and task forces – that are able to plan and promote community mobilisation. There is evidence that these structures work even beyond their PSNP and HABP remit – a clear indication of increased capacity to support resilience. Integrating climate change into PSNP and HABP contingency plans: To effectively build resilience it is crucial to mainstream climate change into delivery mechanisms such as the PSNP and HABP. The CSI is working to integrate climate change into contingency planning, in order to build resilient systems and help timely scaling up of support where and when it is needed. While conceived of primarily as a safety net, the PSNP has proven itself to be an effective instrument for reducing food insecurity and poverty, while simultaneously building adaptive capacity to climate change. As such, it helps form the ’glue’ between the growth and transformation agenda on the one hand, and resilience and the green economy on the other. Based on the now well-documented experiences with the PSNP, there is a strong and compelling case that the GTP II should include a national safety net that builds on and extends the achievements to date. Effective social assistance contributes to social cohesion and the achievement of broader national socioeconomic development and security, making growth more efficient and equitable. Continued support for people who continue to experience food insecurity constitutes a critical investment: it addresses the need for universal food and nutrition security while setting the stage for graduation into more profitable and secure livelihoods and economic activities. Finally, the growing body of evidence from the PSNP demonstrates that a well-designed and well-implemented national safety net can also address the defining challenge of the 21st century – climate change adaptation. The idea that food security, rural growth and climate adaptation are separate and distinct policy areas must be laid to rest. The PSNP experience provides very strong justification for the use of funds delivered through national and international climate finance (including the CRGE Facility) to support a next generation national safety net. SLMP 1&2 has been dedicated to sustainable land and water management and the creation of natural and economic wealth from natural resources. This policy brief examines the inter-connected relationship between land use, land management and land tenure and how this relationship impacts the development of natural resources. This summary synthesizes the findings of two assessments on seed systems impacted by the acute drought of 2016. The report focuses on the impact to smallholder farmers and provides comments on the short and longer term issues of seed system resiliency. This paper provides a very concise overview of the Ethiopian aquaculture sector, pointing out key findings and considerations for investment opportunities. This brief brings together the results of several international research projects focusing on the link between exposure to animal feces and the risk of infections and under nutrition in children. The brief encourages the efforts of the WASH and Agriculture sectors to develop common strategies to reduce these risk factors. This is a chapter from the full book “A Different Kettle of Fish: Gender Integration in Livestock and Fish Research”. It is common knowledge that small ruminants are important for women and those men and women do different household tasks. However, there is a surprising dearth in the scientific literature on how animal diseases affect different household members, or on how gender dynamics affect disease control. This research uses a segregated focus group methodology to examine these differences. Agricultural productivity in the highlands of Ethiopia is threatened by severe land degradation, resulting in significant reductions in agricultural GDP. 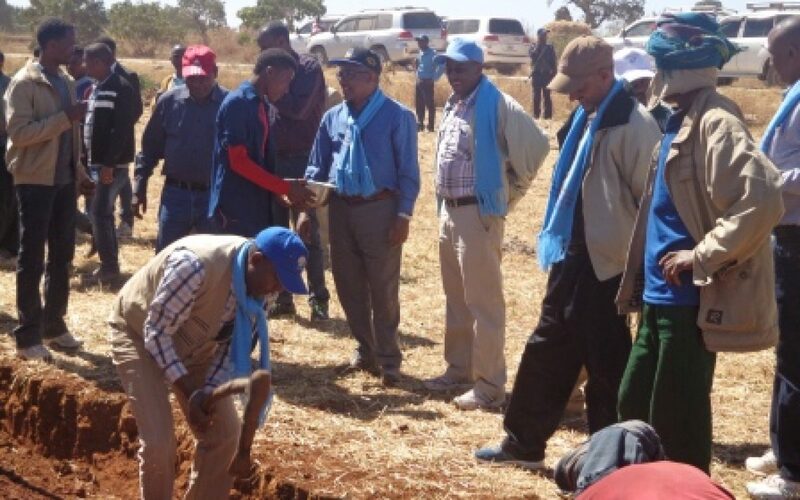 In order to mitigate ongoing erosion and soil nutrient loss in the productive agricultural highlands of the country, the government of Ethiopia initiated a Sustainable Land Management Program (SLMP) targeting 209woredas (districts) in six regions of the country. This study evaluates the impact of SLMP on the value of agricultural production in select woredas by using a panel survey from 2010 to 2014.Whereas previous studies have used cross-sectional data and short timeframe field trials to measure sustainable land management (SLM) effects on agricultural productivity, this analysis exploits data collected over four years to assess impact. The results of this analysis show that participation by farmers in SLMP, regardless of the number of years of participation in the program, is not associated with significant increases in value of production. This may be due to several reasons. First, similar to previous studies, it is possible that longer term maintenance is necessary in order to experience significant benefits. For example, Schmidt and Tadesse (2014) report that farmers must maintain SLM for a minimum of seven years to reap benefits in value of production. Second, this analysis finds that value of production, as well as SLM investments, increased significantly in both treatment and non-treatment areas over the study period. Previous research has found that non-treatment neighbors learn from nearby program areas, and adopt technologies similar to programmed areas, which would dilute the impact measurement of program effects (Bernard et al. 2007; Angelucci and DiMaro 2010). Finally, it is important to note that kebeles that were not selected in the SLMP, but are downstream relative to a targeted kebele may receive indirect benefits through reduced flooding, increased water tables, etc. Thus, the impact of the SLMP may be underestimated here if non-program kebeles are benefiting indirectly from the program. Irrigation development in Ethiopia is in its infancy stage and not contributing its share to the growth of the agriculture sector accordingly. But the country has the potential for its development both in terms of vast suitable land and availability of fresh water resources suitable for irrigation purpose. However, currently limited land is being cultivated under irrigated agriculture and therefore, crop production is predominantly based on rainfed agriculture. Irrigated agriculture is being practiced under smallholders, medium and large scale farming. The small-scale irrigation schemes are understood to include traditional and modern communal schemes up to 200 ha (MoWR 2002). However, ‘traditional’ spate irrigation and even some modern irrigation schemes are also being managed by smallholders as part of small-scale irrigation schemes, whereas the area is quite larger than indicated above. This has been confirmed by some studies carried out by IWMI, which showed that some schemes have the capacity of over 2000 ha that are being managed by smallholders. Traditionally, farmers have built small-scale schemes on their own initiative, but sometimes with some technical and material support from the government and other development actors. Other forms of small-scale irrigation development through storage works that involve small to medium dams and water harvesting can be undertaken through a variety of ways including capturing runoff from rooftops, capturing runoff from local catchments, capturing seasonal floodwaters from local streams and shallow ground water development. The introduction of low-pressure irrigation systems are cost effective to be adopted by smallholder, particularly in areas with scarcity of water. However, the fact is that irrigation development, particularly the smallholders has significant importance to raise production and productivity to achieve food self-sufficiency and ensure food security at household level in particular and the country at large. The irrigated agriculture can also play a vital role in supplying sufficient amount and the required quality of raw materials for domestic agro-industries and increase export earnings. Therefore, considering the importance of the irrigation sub-sector in the overall growth of the agriculture sector, the Government of Ethiopia is giving special emphasis to enhance irrigated agriculture. It is with this aim a tri-lateralcooperation between the three parties involved has been agreed upon and realized the capacity needs assessment and subsequently identified strategic directions. Therefore, the major production constraints impeding development in the irrigation sub-sector among others are: (i) predominantly primitive nature of the overall existing production systems,(ii) shortage of agricultural inputs and credit systems, (iii) limited access to improved irrigation technologies and inadequate research support, (iv) lack of trained manpower and frequent staff turnover, and (v)unstable institutional set up and inadequate extension services and limited availability of capital. Details are highlighted here-under. The gaps in this area include: planning and identification, design-study and construction and operation and maintenance. It gives highlights amid lack of inventory and resource assessment.The need for design guidelines and manuals is indicated. Existing problems in operation and maintenance and weaknesses in the capacity of WUAs is discussed. The need to rehabilitate schemes that are not operational or malfunctioning is highlighted for additional production with limited cost. Lack of proper diversion and regulating, storage and controlling structures are among the major constraints particularly in the traditional schemes. Lack of drainage is one of the constraints in SSI although it is usually neglected. This will inevitably result in gradual reduction of yield and decline in land quality. The major constraints and challenges identified in the area of irrigation water and crop management practices are: Improper crop and varietal selection; improper crop rotation cycle; inappropriate cropping pattern and cropping intensity; inappropriate crop calendar; inadequate availability of small hand tools and farm implements; poor land preparation and leveling; poor soil fertility management; poor irrigation scheduling/crop-water-requirement balance; inappropriate irrigation methods; and inadequate crop pest management practices. The gaps identified include: poor extension system and services. The main extension team member in Ethiopian extension system is the DA. He/she serves over 600 farmers which is too big for proper delivery of the required service, especially where there is little/no means of transportation.There exist no clearly developed irrigation extension methods under practice currently. The farmers do not know how to build proper furrows or how to properly control water flows in the channels and in their fields. The DAs’ extension skill is very variable. In some places there are very skilled and motivated DA’s and in others, not so much so. The skill of development agents in general is low in the area of on-farm water and crop management practices and they are not in a position to effectively assist farmers. The lack of access to market in close proximity has greatly reduced the income that farmers could have gained otherwise. Price information is haphazard, some farmers get it from neighbors or friends visiting the markets and some do not get it at all. The SSI users do not have market structure for their productions. Prices are fixed by traders while farmers have little or no power to bargain on.Storage of farm products and quality control systems are not available that have significantly and negatively affect farmers as a result of high post-harvest losses. The gaps identified in this regard include: lack of clarity in mandates, poor collaboration and networking and poor handing over of irrigation systems. At all levels, there exists low institutional capacity which is critical to enhance development of SSI with respect to development planning,design, implementation, and operation and maintenance including irrigation advisory services.Similarly poor linkages and limited capacities were identified to exist in agricultural research centers and water users’ associations. The need to improve the human resources is also highlighted.Limitations in budget to expand SSI are also indicated as one of the main constraints. Agriculture is the leading sector in the national economy of Ethiopia, accounting for about 46% of GDP, while contributing almost 90% of export earnings and employing 85% of the population. The country is endowed with a wide range of natural resources such as land, irrigation potential and agro-ecological diversities suitable for the growing of various crops and need prime consideration and a more systematic utilization in order to bring a sound change and sustainable growth in the agriculture sector, which positively contributes for the overall economic development of the country. The predominant agricultural system is based on smallholder production and the sub- sector for crop production is entirely dependent on rain-fed agriculture with very limited areas currently developed under irrigation. The agriculture sector is facing a great challenge of not fulfilling the food requirement of the nation and the country is forced to depend on foreign food aid in order to feed its people accordingly. The irrigation potential of the country is estimated to be about 3.7 million hectares, of which about20 to 23% is currently utilized (PASDEP, 2009/10, MoA), even there is no consistent inventory with regard to the developed area under irrigation both traditional and modern irrigation schemes. The major production constraints that impede the development of the irrigation sub- sector among others are predominantly primitive nature of the overall existing production system, shortage and increased price of agricultural inputs and limited availability of improved irrigation technologies,limited trained manpower, inadequate capacity and skills in the area of irrigation, inadequate extension services, particularly in irrigated agriculture. Therefore, the importance of irrigation development, particularly in the peasant sub-sector needs prime consideration to raise production to achieve food self-sufficiency and ensure food security at household level in particular and at country level at large. The irrigated agriculture can also play a vital role in supplying with sufficient amount and the required quality of raw materials for domestic agro- industries and increase export earnings. In recent years there are a large number of small- scale irrigation schemes that have been developed in different parts of the country by the Government and support of different funding agencies. However, due to different environmental and management factors most of these small-scale irrigation schemes are not being exploited fully and irrigation, in general is not contributing its share to the overall economic development of the country as required. Hence, the irrigation sub- sector has to be given top priority in the overall development plans of the country with the ultimate objective of enhancing agricultural production and sustain crop production and alleviate food insecurity problems. This irrigation agronomy training manual is mainly prepared with the prime objective of making the information available primarily for regional irrigation agronomy experts and even the manual can be used by Woreda experts to enhance their theoretical knowledge and upgrade their practical skills in providing efficient and effective technical assistance to farmers engaged in irrigated agriculture. The manual is subject to periodical revision to enrich it with practical field experiences and new research findings. The manual is designed in such a way as to deliver some basic and useful information to the readers. Inpart one of the manual main emphasis is given to principles and practices of irrigation, of which importance of irrigation, ill- effects of irrigation, sources of irrigation water, opportunities, challenges and constraints to irrigated agriculture in Ethiopia, soil- plant-water-relationship, irrigation methods, options for enhancing irrigation water use efficiency,irrigation scheduling, irrigation and cropping pattern,irrigation and fertilizer use are given prime consideration. In part two of the manual included irrigation agronomic practices for major irrigated crops, in which specific coverage of soil and climatic requirements of each crop,recommended varieties for production, improved cultural practices, crop protection measures and harvesting procedures are discussed in detail. At last, annexes are attached to be used as references. This booklet from JICA presents a number of motivational case studies that describe strategies for self-determination of smallholder farmers and provides background to the JICA SHEP Approach (Smallholder Horticulture Empowerment Promotion). This strategy outlines the most significant constraints to agricultural mechanization and proposes interventions that lay the foundations for a more value-adding, efficient and inclusive agricultural landscape in the next five years. Specifically, the vision for the sector is to “Increase national food production and security through enhanced and sustainable use of agricultural mechanization technologies in order to support Ethiopia’s middle-income status by 2015”. This brief outlines the results of integrated delivery systems in producing enhanced genetic gains, productivity and income generation in a range of livestock and fisheries interventions. It points out the opportunities for linking these advanced delivery systems with other development components for increased outcomes. Ethiopia is one of three African countries where the ILSSI project is bringing together researchers, extension workers and farmers to develop mechanisms to improve operational capacity and access to small-scale irrigation technologies. This fact sheet reports on their work in three regions of Ethiopia. This report presents the findings from a gender assessment of dairy value chains in Ethiopia as part of a series carried out as well in Kenya and Rwanda. It aims to formulate country-specific recommendations for Ethiopia, and to contribute to developing general guidelines on how to implement gender sensitive initiatives in the dairy value chain. The Productive Safety Net Programme (PSNP) is one major component of the food security program implemented by the government of Ethiopia with the support from donors that aimed at providing more reliable and timely support to chronically food insecure households starting from 2005. It extends support to these households through two channels: Direct support (DS) and Public Works (PW). PW is a major component of the PSNP designed to address the underlying causes of chronic food insecurity by creating access to market, improving access to services and natural resources, and rehabilitating and enhancing the natural environment. This is achieved by engaging the labor rich but poor households in the construction of various Public works as an employment opportunity in the rural Ethiopia. Since the beginning of the programme in 2005, a number of subprojects have been implemented and it is believed that different community assets are already created. However, results of the progress assessment of the program conducted through PW reviews (PWR), rapid response team mission (RRT), joint review and implementation supervision missions (JRISM) and regular monitoring and evaluations revealed that some of the completed and on-going PW subprojects lack appropriate management and maintenance mechanisms. Hence, developing O&M guideline focusing on key subprojects to have a common and standardized operation and maintenance mechanism among programme areas to address the drawback observed on sustainability of PW was supposed to be important. Thus the Natural Resource Management Directorate of the Ministry of Agriculture has developed this guideline with the intent to provide woreda staffs, DAs and the communities with a practical guidance on PW O&M, in order to address the shortcomings in sustainability of community assets created and increase pace to meet programme objective. The guideline is developed as a reference guide, focusing on key O&M mechanisms for PW subprojects and able to be applied in most of the programme regions. Regions can tailor to suit the local conditions and adapt the guideline to achieve the intended programme outcomes. The guideline can also assist other programs and projects that have similar subprojects implemented at community level.